“Operation Red Box” founder Tom McAbee, Southrifty Drug owner Bob Grisnick and SBA Exec. 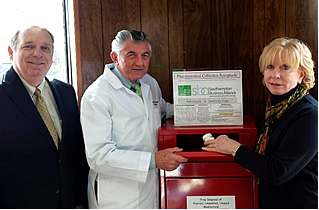 Director Sheryl Heather at the 2014 installation of the Town’s first Red Box at Southrifty Drugs on Jagger Lane in Southampton. You may recall that the Business Alliance sponsored the Township’s first-ever “Big Red” Medical Disposal Box at Southrifty Drug in Southampton back in 2014. Since then the program has expanded to included boxes at White’s in East Hampton, Liggett’s Drug in Hampton Bays and the Sag Harbor Pharmacy. The boxes provide a safe place to dispose of expired or unused prescription drugs, but there is an ongoing cost to maintain them as they require strictly monitored pickup and actual disposal of the medications. To help fund this maintenance cost, the installer has asked us to spread the word to membership about a new advertising opportunity at the Southrifty location, where a digital advertising monitor has been installed on top of the box. Seen by anyone who comes in and out of Southrifty Drugs, ads are available for a very low cost and support a very worthwhile cause. Click here to learn about the Red Box program and responsible medical waste disposal. For more information please contact Tom McAbee, creator of this program at tommcabee@gmail.com. $1,000 to Nicholas Mammina, Riverhead HS, who will be studying Civil Engineering at R.I.T.